The type of pollinators, along with their behavior and abundance, has an important influence on the ability of a rare plant population to be self-sustaining, healthy and persist. Bok Tower Gardens is engaged in multi-year projects to study factors that influence the population dynamics of the rare Clasping Warea (Warea amplexifolia) including its demography, microhabitat requirements, genetic structure, spatial seedling recruitment patterns, response to management, and climate change impacts. We have introduced new populations onto protected lands, and engage in this research within both the natural and introduced populations. In 2016, to begin a look into the breeding system of Clasping Warea, we selected populations in Lake and Polk Counties as study sites, and initiated a study to identify the floral visitors of this species, which had not previously been explored. An insect capture-and-release method was used to isolate floral visitors for photo-documentation, and all insects visiting the flowers over the course of four days in mid-flowering were cataloged. Insects visited the flowers when the plants were in full sun and after the morning dew was completely evaporated away. Seven insect taxa were identified within the Polk County population, and six within a Lake County site, with only two insect species found at both sites. A variety of floral visitors was observed, including butterflies, moths, bees, small flies, ants and wasps. 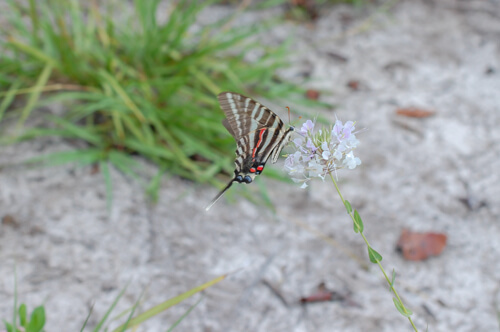 Zebra Swallowtail butterflies were observed at both sites, and a Duskywing Skipper, a common nectar robber, was observed at the Polk County population. Additional insect identifications are underway, as well as a study design for flowering season in 2017, to help reveal timing in the peaks of activity and visitation behavior for each insect, as well as to include additional populations. There is only one known natural population of Savannas Mint in the world. It is located on private land in a subdivision and is threatened with development. Because the private lot has gotten overgrown and has experience the dumping of trash and other impacts, few of the originally observed 185 plants remain. In recent years, the population has had as few as eight plants. Bok Tower Gardens has partnered with the Florida Department of Environmental Protection to introduce populations of this species onto protected park lands. In 2016, we propagated over 800 plants that represent all of the genetic diversity remaining in the species. 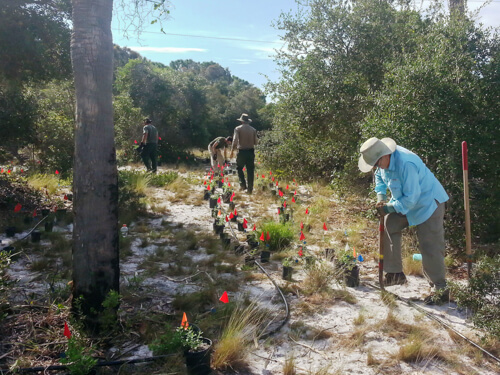 The plants were transplanted them into Savannas Preserve State Park with the help of park staff and volunteers, and volunteers from Americorps and the Florida Native Plant Society. This is the third population of this species that we have introduced into the park, which is going a long way towards preventing its extinction. Introduction efforts are critical to preserve species like Savannas Mint, which will likely go extinct in the wild. 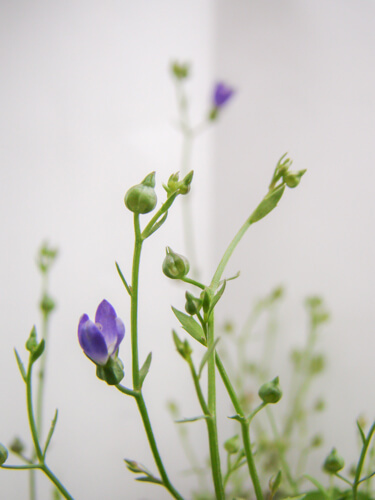 A project initiated was in January 2016 to look at the genetic diversity remaining within this rare Florida endemic, Brooksville bellflower (Campanula robinsiae) and to assess levels of genetic variation between the remaining populations. Up until 2007, this species was only known from three populations within a three-mile area of Hernando County, two of which are now lost. In 2007, a small population scattered among three adjacent locations was discovered two Counties away in Hillsborough River State Park. This genetic study looked at the extant Hernando and Hillsborough County populations, and one of the extinct Hernando populations. C. robinsiae is a short-lived, very small annual that is found between the low and high water levels of ponds and ephemeral wetland areas from mid-March to mid-April. The number of plants that grow each year in each population is very dependent on annual water levels, and the species is highly vulnerable to changes in hydrology and altered winter and spring rainfall patterns. Some years no plants exist because of conditions being either too dry or two wet, and the species has previously disappeared for two years in a row. Little is known about how long the seedbank can survive, nor exactly what is required for seeds to germinate. Preservation of this species will require knowledge of this and many other of the poorly-understood aspects of its biology in order to preserve remaining populations and create new populations on protected land. Nothing has been known to date about its genetic structure. However, one of the most important aspects to understand is if the remaining populations are genetically unique. This project provides the first step towards addressing this question. In spring 2016, leaf and stem samples were collected from fresh seedling tissue from the three study populations, and DNA was extracted from each sample. The internal transcribed spacer (ITS) gene regions was amplified from each of the DNA samples, and used in a fingerprinted techniqued called RFLP (Restriction Fragment Length Polymorphisms). In the RFLP reactions, the ITS gene was cut (digested) using several different restriction enzymes. Restriction enzymes naturally occur within bacterial organisms as part of a protective mechanism to destroy foreign viral DNA, and are named after the bacterial organism and strain from which they were discovered and isolated. For instance. the restriction enzyme AluI was isolated from bacterium Arthrobacter luteus strain I. These restriction enzymes have very specific DNA recognition sites and only digest the DNA at those sites. Scientists discovered that these restriction enzymes could be employed for several molecular applications, including digesting DNA for genetic analysis. For this project, several restriction enzymes were selected, all with different recognition sites, to digest the amplified ITS DNA and analyze for different polymorphisms (alleles) across samples. Genetically similar individuals should generate similar fragment sizes, while unique individuals will have unique banding patterns. The restriction enzymes that have been used thus far, AluI, HaeIII and RsaI, have only revealed three polymorphisms total, suggesting a low level of genetic diversity among the populations. Only two individuals of 57 total in our study have been consistently and uniquely polymorphic, while the majority of the remaining individuals are identical. To further investige polymorphisms within the ITS gene within the plant samples, we are currently using four additional restriction enzymes: BstUI, DpnI, TaqαI and MseI. Each of these have only four base pair recognition sites. Enzymes with less recognition site specificity should increase the likelihood of producing more DNA bands after the digestion reactions, and therefore more banding patterns that will reveal genetic differences between individuals. Once the banding patterns for each individual are known, we can assign genotypes and begin a genetic analysis. This will reveal how unique or similar each population is from another, and help determine appropriate conservation actions. If different populations are genetically similar, an optimum conservation strategy may be to use an admixture of seeds when establishing a new population to help increase genetic diversity. If the populations are genetically unique it may be in the best interest to avoid mixing germplasm from the separate populations and preserve the uniqueness of each. Unique genetic diversity may indicate a local adaptation to that particular environment, and introducing new genes may weaken the population or result in the loss of important alleles. A population that is genetically diverse has a greater probability that enough unique alleles are present within the population to survive potential devastating environmental factors or diseases. At the conclusion of this project, we expect to have the key information we need about the genetic diversity within C. robinsiae to be able to pursue the important conservation goals such as outlining the best strategy for population introductions and augmentations. Ocala Vetch, Vicia ocalensis, is an herbaceous, perennial vine which grows in sandy peat along the shoreline of natural springs systems in the Ocala National Forest. There are only three historically known populations of this species, and only two remain, the third having disappeared in 2003. Very little is known about this species, and much needs to be learned about its basic biology in order to make decisions on strategies for its preservation. The pollinators for this species and whether it can hybridize with other Vicia species is unknown. We have been engaged in studies into the microhabitat requirements of this species, into factors influencing its germination and survival, and looking at the genetic diversity remaining within the species and between the populations. 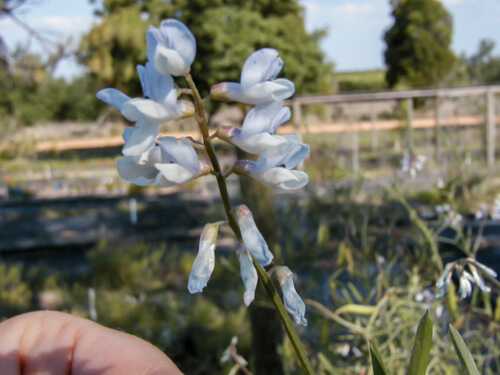 In 2016, we began a collaborative project with Dr. Carrie Kiel of Rancho Santa Ana Botanic Garden to use molecular methods to see the relatedness of V. ocalensis to other Florida Vicia species. This is important because populations of the different species can overlap, and if they are closely related there is the potential for hybridization. Leaf samples from several species were collected, and DNA was extracted from each. Dr. Kiel amplified and sequenced specific gene regions that are dependable and widely used for plant molecular phylogenies. Early results suggest that V. ocalensis is closely related to the Four-leaf Vetch, V. acutifolia, which is also found in wetland areas, but all throughout peninsular Florida. Small, isolated plant populations may have less genetic diversity and have less variation in morphological traits of individuals plants. The natural population of Savannas Mint (Dicerandra immaculata var. savannarum) has been gradually reduced over the past few years to very few plants, which may have had consequences on the genetic and morphological diversity present in the populations. It’s this diversity that allows populations to adapt to changing environmental conditions, withstand disease and rebound after periods of stresses such as drought. A loss in the fine variations in size of floral features between individuals may affect the ability of insects to pollinate plants. We performed a second year of taking floral measurement on Savannas Mint individuals in 2016. We compared measurements of plants in the small natural population to those of plants within the two large, more diverse introduced populations. 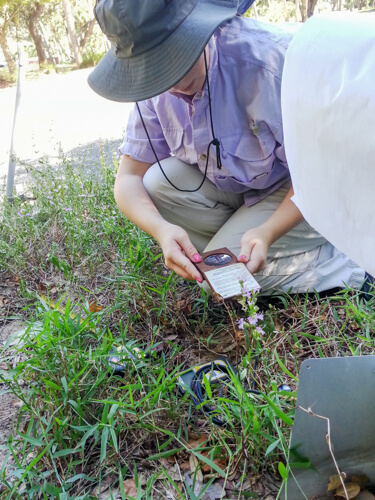 To see if flower size could be correlated with habitat characteristics, we recorded features like percent canopy cover around every measured plant. Comparing flower size over two years can also help determine if there is annual variation in flower morphology. The rare Clasping Warea (Warea amplexifolia) is endemic to the rolling Sandhills along the Lake Wales Ridge from Polk County to Marion County. It is also one of the rare species experiencing an alarmingly rapid loss of populations due to increased development in these areas. In a race against time to understand and preserve this species, we have been engaged in long-term, ongoing projects designed to understand its reproductive biology, regularly track the status of remaining populations, study its microhabitat needs, restore its habitat, and introduce new populations onto protected lands. We are partnering with Florida Department of Environmental Protection biologists and land managers for a long-term project at Lake Louisa State Park to restore Sandhill habitat and introduce the rare Clasping Warea and associated native species into the Park. In early 2016, sites were selected for multi-year efforts, and in July 2016, the first phase of establishing the Clasping Warea in the park took place. With the help of eight staff and volunteers over two days, irrigation lines were laid out and over 900 seedlings were transplanted with two locations. After two months, most of the plants were thriving and beginning to flower. The seeds produced in these new populations will be the first to establish a seedbank within the park and help support self-sustaining populations. 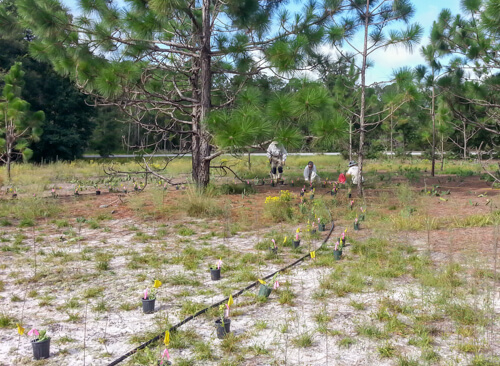 Additional restoration efforts in the park are underway, including sowing wiregrass seeds, removal of exotic invasive species, and planting of Long leaf pines. BTG and land managers continue to work hard to restore areas at Lake Louisa State Park to back healthy Sandhill for the benefit of ecosystem and biodiversity preservation, and the enjoyment and education of Park visitors.